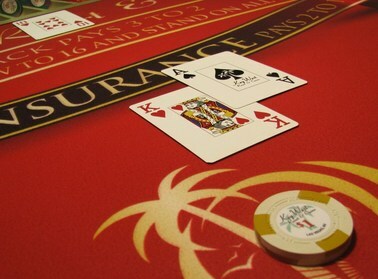 This month, we're inviting our customers to play a hand of blackjack at the Key West's real blackjack table. Place an order in September for our Key West chips, playing cards, dealer buttons, or any other item, and you'll automatically be entered to win, and get a seat at our blackjack table for one hand. We'll put two $1 chips in the betting circle for you, and play your hand according to our blackjack strategy card. Our dealer will stand on all 17s, and hit on 16 or below. A push does not win, but you'll get a new hand. This is a promotion, so you won't wager $2. Your odds of winning a $2 discount on your order are exactly 1 to 1. The odds of getting blackjack are 1 in 10. We've already recorded 20 hands of blackjack and included numbers from invoices we'll use for September orders. When you order, you'll get an invoice number, and we'll email you a link to this page so you can actually see your hand and the result. Play continues until Sept. 30, or until we give away $75 in discounts. ​The videos are posted below. Good luck!